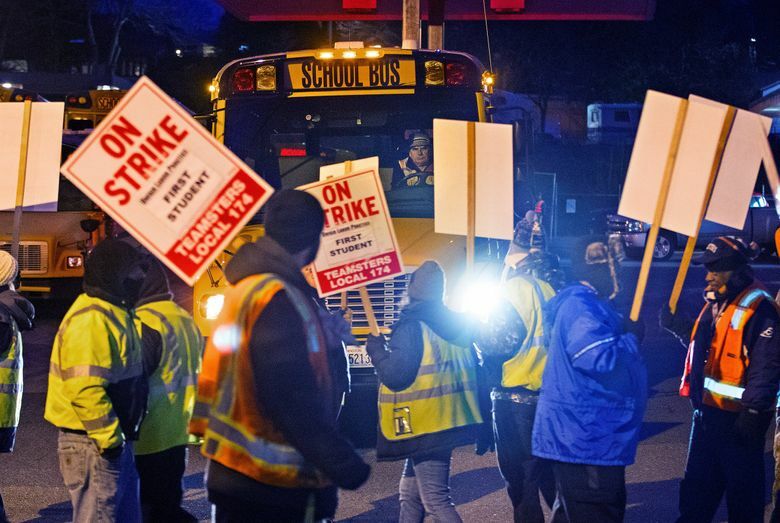 Seattle school-bus drivers will strike Wednesday for fifth consecutive day. Seattle teachers union members will stage a walkout Wednesday to show solidarity with the district’s school-bus drivers, who have been on strike since last Thursday. Seattle schools have early releases on Wednesday, so union members won’t walk out until the school day has ended and students have already left, Seattle Education Association (SEA) President Phyllis Campano said. Members plan to picket at the First Student bus lots in Lake City and South Park, and near Franklin and Ballard high schools. Seattle school-bus drivers will strike Wednesday for the fifth consecutive day, according to Teamsters Local 174, the union that represents 400 drivers who are employed by bus-contractor First Student. Contract negotiations between the union and First Student stalled last week, and neither side has reached out to the other to return to the negotiating table. About 12,000 Seattle students take a yellow bus daily. The Seattle school district has said it will wait to determine damages until the issues between the two sides are resolved. The union previously went on a one-day strike in November. Healthcare and retirement plans are at the center of First Student and the union’s contract dispute. The union says it wants a more affordable health-care plan and the most recent offer from First Student wasn’t adequate. First Student says its offer is fair and equitable to the drivers.